I just ran across this superb infographic and had to share it with you. It shows you popular soft and energy drinks with the amount of sugar in each. 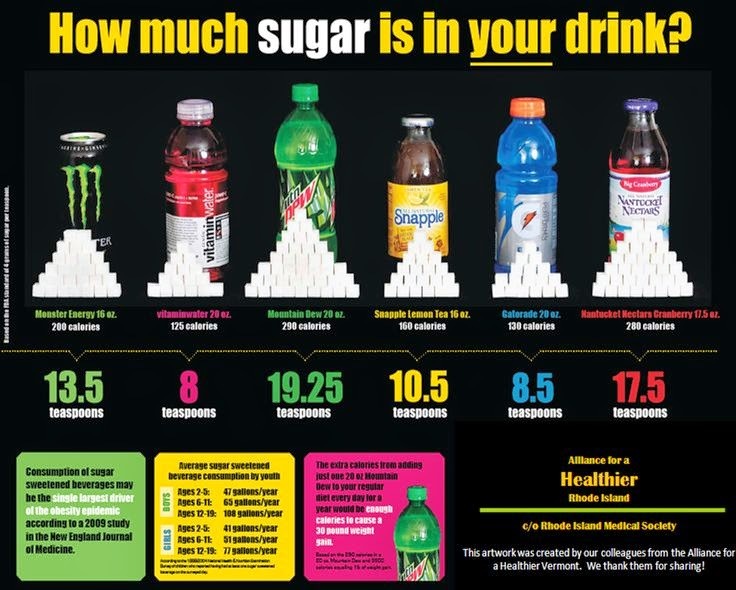 Did you know that Mountain Dew had 19+ teaspoons of sugar in a 20 ounce bottle? I sure didn’t. There are 4.2 grams in a teaspoon full of sugar. If you carry that away with you, you will know a very valuable little factoid. So, when you look at the ingredients panel and it says 30 grams of sugar, you will know that you are thinking of drinking seven teaspoons of sugar. Maybe it will give you pause. How Many Calories in McDonald’s Chocolate Chip Frappe and How Much Sugar? What Does The American Heart Association Say About Sugar? Why You Shouldn’t Drink McDonald’s Frozen Strawberry Lemonade.